SEVEN TIMES more unique tweets than the basic Twitter Buzz plan! Twitter is one of the fastest growing social media networking sites in the world today. Based on the simple premise of answering the question, “What are you doing?” in 280 characters or less, it has become a more intimate site for people to exchange information and for artists to market themselves without all the fluff seen elsewhere on the internet. With our Twitter Buzz service, we use our vast network of Twitter accounts to get your message out to 175,000 music fans or more from your genre. All in all, our entire network includes more than 1 Million music fans (and growing). Whatever kind of music you’re creating, we’ll get the message out to a relevant audience. We drive traffic to the online destinations you deem most valuable. Similar to the basic Twitter Buzz service, four tweets will be tweeted per day containing your messages directing people to iTunes, Facebook, YouTube, Reverb Nation or wherever you’d like them to visit. 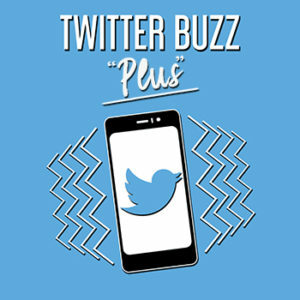 But, unlike our basic Twitter Buzz service, Twitter Buzz “Plus” allows you to enter up to two weeks worth of unique tweets (56 unique tweets in total). That’s SEVEN TIMES the number of tweets allowed under the basic Twitter Buzz plan.